Authentic rural cooking holiday at Finca al-manzil. Creative cooking based on the cultural flow between Iberic,Moroccan, Middle Eastern and Latin American cuisine. In ancient Rome, panis focacius was a flat bread baked in the ashes of the hearth (focus in Latin). This became a diverse range of breads that include “focaccia” in Italian cuisine, “hogaza” in Spain, “fogassa” in Catalonia, “fugassa” in Ligurian, “pogača” in the Balkans, “fougasse” in Provence, “fouaisse” or “foisse” in Burgundy. The French versions are more likely to have additions in the form of olives, cheese, anchovies etc, which may be regarded as a form of pizza without the tomato. There is also in Portugal the “fogaça“, a sweet bread. Fougasse was traditionally used to assess the temperature of a wood fired oven. The time it would take to bake gives an idea of the oven temperature and whether the rest of the bread can be loaded. It is always better to make bread by hand to achieve a lighter loaf. Give time to the dough. The quicker you make it, the quicker it will go stale. Be accurate about your quantities. I weigh everything, including my water. Use a good strong white flour. Fresh yeast is best. If you use dried, only use half of what is recommended as it is often too strong. Bake at the hottest oven temperature possible and straight onto a baking stone, ideally made from granite or terracotta, never marble. To get a really good crust, where all the flavour is, preheat the oven and spray water very finely inside with 15-20 squirts to create steam. Then load the oven and finish with five more squirts and close the door. Bake the last three to four minutes with the oven door open a fraction to give a crisper crust. Essential tool: a plastic scraper – an "extension of my hands" – which you cut, scrape and do everything with. Preheat oven to its highest level. Rub the yeast into the flour (or mix in if using dried yeast). Add the remaining ingredients and the water. Mix for a couple of minutes until the dough starts to form. Transfer the dough onto your working surface. Continue to mix the ingredients by stretching out the dough and folding it over onto itself. Keep working the dough until it comes cleanly away from the work surface and is not sticky. Lightly flour the work surface, place the dough on the flour and form the dough into a ball. Place the dough into a mixing bowl and cover with a tea towel. Rest the dough for a minimum of an hour. Turn out gently onto a well-floured surface. Be careful not to deflate it but expect it to spread out to cover a square of your work surface. Generously flour the top of the dough, cover with a clean tea towel and rest for five minutes. Using a plastic scraper (or a thin wooden spatula), divide the dough into two oblongs then cut each piece again into three roughly triangular strips. Make 1 large diagonal cut in each piece of dough, making sure you cut right through to the work surface but not through to the corners. Make 3 smaller diagonal cuts on each side of the central one. Gently open out the holes with your fingers and shake off the excess flour. Lift onto a lightly floured baking tray and slide onto the hot baking stone or tray in your oven. Bake for 10 to 12 minutes until golden brown. Variations – before leaving the dough to rest, add halved olives, roasted peppers or onions or press rosemary or thyme leaves into each one before baking. 1. For the tapenade, place all the ingredients in an electric blender and process until smooth. 2. To make the fougasse, mix 200g of the flour with the yeast and 180ml of the water. Beat this mixture for 3 minutes, until the yeast dissolves completely and leave to rise for 3 hours. 3. Add the remaining flour, salt, oil and enough water to make a smooth dough. Knead until springy - about 5 minutes. Leave to rise again for another 30 minutes. 4. Divide the dough into two balls and roll each into a circle, about 1cm thick. Place one circle onto a greaseproof paper-lined baking tray or bread stone, and spread with the tapenade. Top with the remaining circle. 5. With a sharp knife, cut slashes across the bread. Brush with olive oil and leave to rise for a final 30 minutes. Brush on olive oil and sprinkle lightly with sea salt. Note. If you are adding herbs/spices eg. rosemary or thyme leaves on top, add them just before baking. Preheat the oven to 180C and grease and line an oven dish or cake tin (30cm diameter is ideal). Cook the onion and garlic in a little olive oil until soft, then set aside to cool slightly. Beat the eggs, oil and yoghurt together in a large bowl. Stir in the cooked onion and garlic, red pepper flakes, roasted red pepper, olives and sundried tomatoes. Sift the flour and baking powder over the top and gently combine. Spoon into the prepared tin and bake for 40-50 minutes. Cool to room temperature before cutting into wedges. Serve with salad for a delicious spring lunch. The French love their tapenade made from lusty black Nicoise olives. The Italians choose rich Gaeta olives for theirs. The Spanish Manzanilla olives offer a fruitier-tasting version. These olives are small, slightly sweeter green olives. 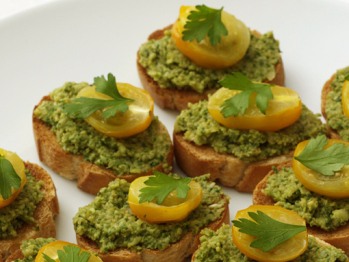 Blended with extra virgin Spanish olive oil, which has a smooth, sweet flavor reminiscent of fruit and almonds, the bite of the tapenade is mellowed and then brightened with the addition of lemon juice and cilantro. Spread on large croutons, brushed with oil and toasted, and serve with a Fino sherry for a perfect tapa together with salted toasted almonds. In a food processor, combine olives, garlic and capers. Process until just smooth, scraping down the sides of the bowl if necessary. With the machine running, slowly drizzle in the oil and lemon juice through the feed tube and process until well combined. Transfer the mixture to a bowl and fold in the cilantro and pepper. Let rest at room temperature for 1 hour for the flavors to come out. I am in a cooking class and my assignment is to find green olive recipes and I came across this post. The manzanilla tapenade looks really good. I can't wait to try it. Thanks for sharing! Thank you for such a fantastic blog , and I have been on the lookout for such information on holiday cooking recipe ferries ibiza formentera.